The RP Photonics Buyer's Guide contains 3 suppliers for photonic bandgap fibers. Photonic bandgap fibers are optical fibers where a photonic bandgap effect rather than a core region with increased refractive index is utilized for guiding light. Essentially, a kind of two-dimensional Bragg mirror is employed. Such a guiding mechanism normally works only in a limited wavelength region. The earliest realization of such fibers, called Bragg fibers, was based on concentric rings with different refractive index . Later, a special type of photonic crystal fiber has been developed, which also implements guidance with a photonic bandgap [3, 6], but in this case based on tiny air holes. The refractive index of the core itself can be lower than that of the cladding structure. The core can even be hollow (→ hollow-core fibers), so that its refractive index is that of air (close to 1). 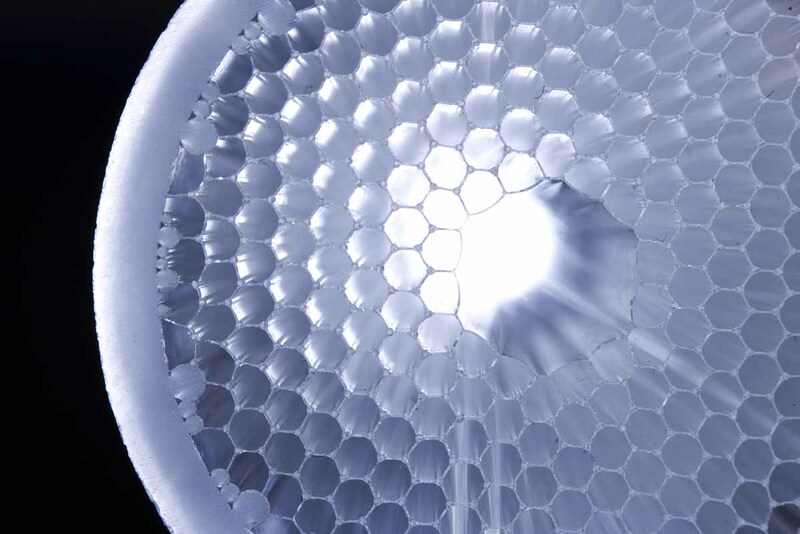 As most of the light is then propagating in air rather than in glass (air-guiding fibers), such kinds of hollow-core photonic bandgap fibers may be used for guiding light in spectral regions where the absorption in the glass is relatively high. For example, light from a CO2 laser may be guided. Also, hollow-core fibers have a very weak nonlinearity, which makes them promising e.g. for the dispersive compression of ultrashort pulses with high peak power, or for the delivery of high-power laser beams. However, photonic bandgap fibers are generally more difficult to produce due to their tight fabrication tolerances, have a limited bandwidth for low-loss transmission, and often exhibit relatively high propagation losses. It is also substantially more difficult to understand and model their propagation characteristics, compared to index-guiding fibers.